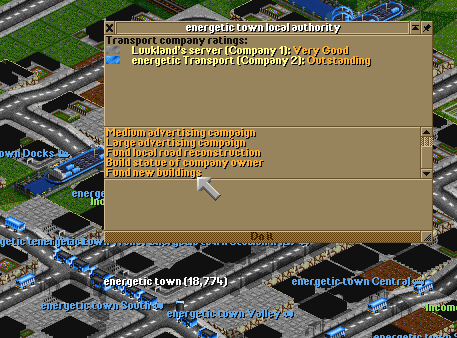 Funding new buildings is very important when growing your town. There is a counter each town has and when it reach zero the city tries to place a new building (rumors says its 1/12 that a tile will become a building). A city may count down from around 160, but with 'fund new buildings' this counter may start at much lower value like 80 (double growth speed). This counter is also effected by the city population and number of active stations (max 5; a active station is one that is served at least once a month). There is also a boolean (true of false value) if the town is going to grow or not. If you lack any resources in city building, your town growth will be set to false and no matter how much you spend on fund new building, it will not help your city grow. This page was last modified on 4 September 2015, at 15:50.